Cain's murder of Abel is related in the Quran 5:27-32, but Abel is not mentioned by name. Muslim exegetes relate that Cain wanted to marry his own twin sister rather than allow his brother Abel to marry her as dictated by their father Adam. This tomb of Abel is located in the mountains west of Damascus, near the Baqa'a Valley, near the Syrian town of Suq Wadi Barada. The tomb is housed in a complex of buildings that includes a mosque and a large gathering area. The tomb itself is roughly 9-10 meters in length and is visited regularly by Muslim pilgrims from South Asia. 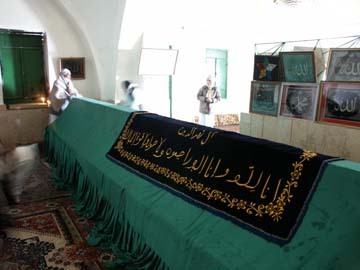 Other tombs in this same mountain range include the tomb of the prophet Seth. Nearby this tomb, on Mount Qasyun overlooking Damascus, is the so-called "Cave of Blood" in which Abel is said to have been killed.